Philadelphia Eagles legend Brian Dawkins' official title is listed on the team's website as "Executive / Football Operations," working in the Birds' scouting department. Unofficially, he also helps coach the defensive backs and linebackers, teaching techniques, and making himself available to any player who needs any kind of guidance, football-related, or other. The respect that Dawkins garners from the players is obvious, and a number of players have spoken in glowing terms about what he his presence has meant to them. 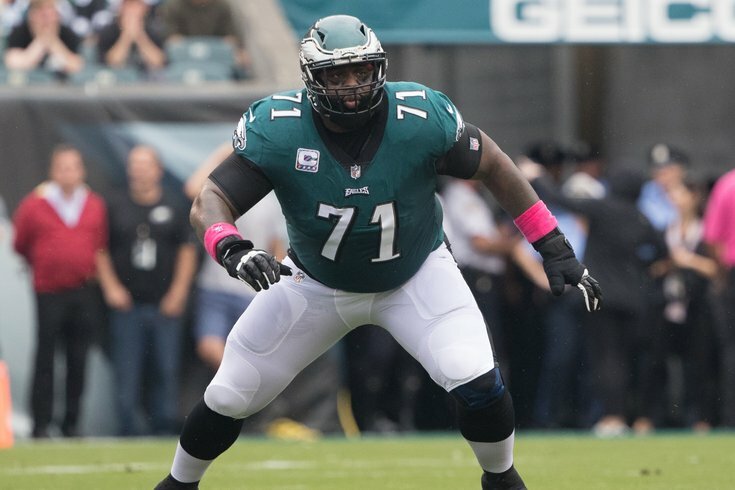 A player with a similar level of juice as Dawkins within the Eagles' locker room is Jason Peters, who has acted as something of an assistant offensive line coach since he tore his ACL and MCL against the Washington Redskins in October. "He commands a lot of attention when he walks in the room, with his stature and his personality," said Lane Johnson. "One thing about him, though, is that he never comes off as arrogant, because he’s not. So I think a lot of players come to him as a teacher, because he’s very open, and he knows how to teach, and he knows how players think." Eagles offensive line coach Jeff Stoutland has gone as far as to rely on Peters' help to maximize his efficiency a positional coach. "Especially with (Halapoulivaati Vaitai), I’ve asked him during games, and even on film, to look at his set lines, and things like that, and he’s helped me, giving feedback on that because I’m coaching many players," Stoutland said. "So to get another eye on it helps." Vaitai took over for Peters at left tackle after Peters was lost for the season, and Peters began serving as a personal tutor for him the minute he was physically able to re-join the team at the NovaCare Complex. "The moment that Jason could get back into the building, he was around the offensive line every single day, really like all of our injured guys are," Doug Pederson explained. "He’s been a mentor obviously to Big V. He’s coached him up on and off the football field. He’s around him now more these past few weeks in practice, and obviously out here in the meetings and things like that. He’s just been a great asset to that offensive line as a group. He’s a big leader of that unit." "Last year I sat V next to JP in the meeting room, so that he could tutor him as the meetings went on," said Stoutland. "That happened way, way back, and that has carried over into now. I know it’s hard for JP, because there’s nothing more than he would want than to play in this game." In his first professional start in 2016, after Johnson was lost to a suspension, Vaitai had a brutal outing against Ryan Kerrigan and the Washington Redskins. He has since come a long way, shutting down one of the best edge rushers in the NFL in Everson Griffen in the NFC Championship Game. Vaitai said that Peters has been a calming influence, and gave some credit to Peters for the improvements he has made over the last two seasons. "Coach Stoutland put me with Jason because he wanted me to calm down," Vaitai said. "It was nerve-wracking my very first game in the NFL as rookie. I didn't know what to expect. Everything I do, I just try to play for Jason. I wish he was here playing for us right now. I still have a lot of improving to do, but with Jason Peters by my side, it means a lot, just trying to play for him." So could Peters be a scout or a coach in the NFL? "Having played the position, he could be a good coach if he chooses to do that," said Pederson. "I think coaching would be an excellent career choice for him," said Johnson. "He would be a great coach, with all the knowledge he has," said Vaitai. "I don’t know if he would want to do that and spend all those hours, but he has an eye for talent," said Stoutland. "He really has a great eye for talent. He can tell you who’s good, who’s not good, who has a natural ability to slide his feet. And also when you’re coaching the detail of the set lines, especially in protection, he’s a master at that stuff." To be determined when Jason Peters will decide to retire. Whenever he does, maybe he is the "next Brian Dawkins," a pseudo-coach, not by title, but a former player that has the respect of everyone in the building, and is an outstanding source of knowledge, both on and off the field.